For those jobs in your garage or workshop where sheer brawn just isn’t going to cut the mustard, what you need by your side is a reliable and powerful cordless impact wrench to make short work of loosening and tightening bolts, nuts, and lugs. It’s an incredibly useful and versatile tool and one that is well worth adding to your home power tool armory! If you don’t have one already or you fancy upgrading to something more efficient, cordless and perhaps also features a brushless motor, we’ve pulled together our pick of the best around. Once you’ve invested in one of the best cordless impact wrenches, you will definitely wonder how you ever survived without one. Our first product recommendation in the best cordless impact wrench category represents excellent value for money and as such is today’s Best Choice product. It’s from one of the construction industries favorite brands, Dewalt and is instantly recognizable with that famous black and yellow branding. Their DC825D cordless impact wrench is an excellent example of a compact and operator friendly power tool which features a frames motor for extended durability and increased lifespan. It’s capable of tackling a wide range of fastening applications and utilities their XRP extended run-time battery system so that you can work longer to get the job in hand completed. It’s great for more extended work sessions as well as getting into those tight spots, thanks to that textured anti-slip comfort grip and evenly balanced lightweight handling which helps to reduce user fatigue. It’s easy to control and delivers fast and accurate results featuring variable speed control taking you from 0 to 2400 RPM and 0 to 2700 IPM. 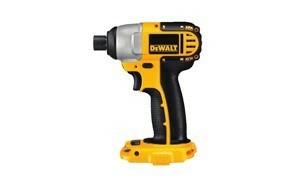 The only drawback is that this is a bare tool meaning that it doesn’t come supplied with a battery or charger, however, as part of the Dewalt range of power tools, it can be used in conjunction with their 18-Volt XRP battery pack system which is proven to deliver up to 40% more run time and efficiency than regular Ni-Cad batteries. If you love cordless tools,make sure you check our guide to the best cordless drills. We love the bright red design of our next high impact wrench from Milwaukee with its iconic white lightning bolt stripe on the side. Small it might be, but mighty in power it is too. It happens to be one of the most compact models in its class at just 8.39” in length. 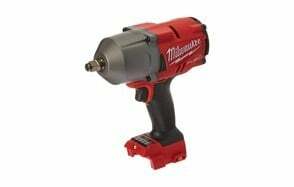 Don’t let those cutesy features belie how reliable this Milwaukee 2767-20 really is. It’s a high-quality tool with an impressive brushless motor capable of delivering up to 1000 lb/ft of torque when positioned to its highest setting. What that means for anyone handling this mean machine, is that it can effortlessly loosen and tighten even the most stubborn bolts with its fully tailored and controlled 4 x speed options. Featuring Redlink plus intelligence as well as Redlithium batteries, it won’t overload or overheat as that overload software actually protects the battery and the motor from damage. A fitted friction ring enables quick and easy socket changes while the premium rubber overmold means that our Premium Pick high impact torch is comfortable to hold as well as being about to withstand corrosion. Perfect if you are working in a tight spot, it even has an LED light to illuminate your work area further. Make sure you also check our guide to the best drill presses. If you’re thinking that it’s about time you invested in a cordless impact wrench either to support your work as a contractor or just because you want to beef up your home power tool arsenal, then this option from Ryobi is a smart and cost-effective option. With three running speeds to select from and a motor which has the capacity to reach up to 3200 impacts per minute, this Ryobi P261 offers the ultimate control when it comes to fastening and loosening various nuts, bolts, and lugs. It produces a respectably powerful 300 ft.lbs of maximum torque, and with a square anvil system, you can work safely, efficiently and also accurately. Built into this impact wrench, there’s a Try LED light which focuses extra light where you need it the most meaning that you can work in tight spots and also less than desirable working conditions. It’s great for a range of heavy-duty applications and is compact in design yet sturdy and reliable in construction. The unit additionally features a rubberized control grip which ensures that you can keep a firm and comfortable hold on your electric impact wrench even if you are working in slippery conditions. It’s great to use for extended work periods and is a must-have tool for any construction worker and a perfect DIY gift for any handyman. This is another great choice up next from Porter Cable which gets plenty of great feedback online from happy customers. It’s especially popular with those working within the automotive industries for whom this impact wrench was ideally designed. If you just love tinkering with cars, then you will love this Porter Cable 1/2 inch wrench. The housing is rugged and corrosion resistant, and with the power to drive up to 1650 RPM’s, you can fasten and loosen quickly and reliably. The motor might not be brushless like some of the other impact wrenches we’ve been reviewing, but it is powerful, delivering 310lb/ft of torque with a fully variable speed trigger which provides precision control. It does pack plenty of punch and overall is good value for money too. It’s a little on the heavier side at 5 pounds in weight and almost 10 inches long, but it’s well balanced when operating and comfortable to hold. That 1/2 inch hog fitting also process for quick, easy and efficient socket changes. 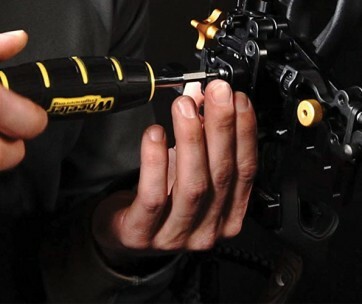 Our handy guide to the best torque wrenches features more great products like this. We’re taking a look at something from the Craftsman range next, another well-respected brand who make seriously reliable and good looking power tools that are incredibly popular with professionals and keen DIY’ers alike. This Craftsman 1/2 inch Cordless Impact Wrench boasts an impressive 300 ft-lbs of powerful torque which can make short work of breaking free even the tighter of nuts and bolts with relative ease. It’s a great option if you’re an automotive user or love nothing better than hanging out in your garage working on some new car-related project. It comes fitted with a 4Ah XCP Lithium-Ion battery which increases that torque power by a further 20% and can add 4x the runtime over the more traditional style Ni-Cad battery powered wrenches. It’s sturdy, reliable and dependable no matter what weather conditions you’re working in and can deal with all kinds of extreme conditions from 5 to 158 degrees. Not sure the same can be said for you though! It features what’s known as a multi-chemistry charger which basically means you’ll be back up and running again in no time plus there are LED lights to better illuminate your workspace and a comfortable micro-texture overmold grip which enhances that tactile control and precision when operating. With a square anvil that delivers up to 3000 impacts per minute, this is one powerful and impressive battery powered impact wrench at an incredible sub $200 price point. Love this product? Check out our review of the best torque screwdrivers for our top picks. Next to get the treatment in our impressive line-up of the best cordless impact wrenches guide is this compact and ergonomically friendly power tool from Makita. Featuring a Brushless motor and powered by a Lithium-Ion battery, it’s teeny tiny in size at just under 6-inches long but man does it have some slaying power! Weighing less than 3 pounds too, it’s also comfortable and lightweight to manage and is perfect for getting into all those tight spots and head to reach places. It boasts an ergonomic, soft grip handle and also comes with 3 x speed power selection switch. Clearly, Makita XWT11Z is not going be the most highly powered impact wrench on our list, but it’s still feature packed, being precise and controllable as well as compact. There’s reverse rotation as well as a built-in LED light to help better illuminate your, and a 3-stage LED battery gauge indicator that conveniently lets you know how much battery life you have remaining. Charging is fast, and the 18V Lithium-Ion battery means you can spend more time working and less time charging! Find more great products like this by checking out our guide to the best screw guns. If you don’t want to break the budget but would like to invest in an impact wrench that’s both powerful as well as being cordless, then our next recommendation from VonHaus with its premium 20V max motor could be a serious contender. Perfect for use both indoors and out thanks to that cordless versatility, it features a variable speed trigger as well as being able to offer directional control. You get quite a lot of kit for your money from Von Haus, including a convenient storage bag as well as a super handy belt hook so that you can keep your wrench where you need it most, right by your side. Talking of which, while it’s strong and powerful, Von Haus 1/2 inch 20-Volt Cordless Impact Wrench is also lightweight to operate and won’t cause user fatigue. Besides that variable speed trigger, it’s also multi-directional and can be run in both forward and reverse. There’s a 75-minute rapid charge function and LED charge indicator lights to let you know when it’s time to give your Von Haus impact wrench a power boost. If you’re a fan of Von Haus power tools, then you’ll be pleased to know that the 20V Max Series Lithium-Ion D series battery is compatible and interchangeable across their range. If you are a passionate handyman, check out our guide to the best heat guns. If compact is what you’re looking for, then this Bosch Bare Tool will definitely tick that box having been purposefully designed for increased maneuverability in tight spaces. At only 6-inches in length, it’s one of the shortest and most compact cordless impact wrenches on the market and perfect for getting you into those tight spots. Not only that, but it also has a built-in LED light so if you are working in a dark or enclosed space, you will have good vision as well as an excellent range of motion to still work. It features a spring-loaded mechanism which helps reduce user fatigue plus it also has an ergonomic grip for comfortable operation. It’s rugged and reliable enough to satisfy the Pro’s among you, yet user-friendly for any novices who are new to working with impact wrenches. Offering 1600-inch/lbs of torque, it’s by no means the most powerful wrench we’re reviewing today but it is reliable and an excellent choice if you want something that first and foremost is compact and easy to use. Make sure you always have it handy in your tool bag. Another powerful and precise cordless impact wrench up next, this time from Ridgid with their R86011B tool. Featuring 4 different mode settings and a powerful brushless motor, this 18-volt impact wrench is suitable for a wide range of applications and professions. With Tri-Beam LED lights located on the front of the housing, you can still work in dimly lit conditions without fear of casting shadows that could hinder the accuracy and precision of your work. It’s excellent for heavy-duty work with a powerful and impressive 450 ft-lbs of adjustable torque plus there’s a convenient auto mode setting which enables the tool to shut down before any damage or over tightening can take place. With a max high speed of 2600 RPM, Ridgid R86001B wrench should bring all the power you’re ever likely to need. Truth be known, it’s a bit of a beast! You might also like to check our best soldering kits review. Measuring less than 5-inches in length, this stubby style compact cordless impact wrench kit from Milwaukee is the perfect tool to use in tight spaces. Despite how small it is, it’s definitely big on stature and is capable of delivering 250 ft-lbs of breakaway torque which is more than adequate for quickly removing stubborn bolts. It features 4-Mode Drive control so that you can select to operate in one of the three-speed settings as well as feating a built-in safety auto-mode which prevents over-fastening. Besides the impact wrench itself, in this kit from Milwaukee, you’ll also receive two battery packs and a charger as well as a carry bag to conveniently store and transport your tool safely from one job site to another. The Milwaukee 2554-22 M12 Fuel is powered by their Redlink intelligent technology as well as Redlithium batteries which are proven to deliver more work output per charge. It’s a comprehensive kit that’s perfect for professionals or hobbyists. Our selection of the best jigsaws offer more great tools so check it out. We’re pulling out the big guns for our final recommendation in today’s best cordless impact wrench review with this beast from Kobalt. With a whopping 24-volt max high-capacity Lithium-Ion battery this wrench can really go some! Thanks to an incredibly efficient and super reliable brushless motor, it can power output to 650 ft-lbs of breakaway torque which gives it quite some welly! Kobalt Cordless Impact Wrench comes with a variable speed trigger as well as LED work lights that handily illuminate your workspace. There’s also a convenient built-in fuel gauge so you can keep a watchful eye on how your battery life is faring and when it’s time to give it a recharge. It’s fast, powerful, reliable and efficient plus it even comes with its own portable storage bag. The products which have made it onto our coveted buying guide have done so because they all combine power and versatility, with reliability and fantastic peer feedback. From professionals to enthusiastic novices, our range of cordless impact wrenches all get the big thumbs up from a cross-section of reviewers. We’ve aimed to pull together a variety of power tools from all the most highly regarded and recognized brands within the category as well as a good representation of price points to suit all budgets. There’s a wide range of choice and flexibility when it comes to selecting an impact wrench and what’s appropriate for one person might not necessarily be right for another. For those of you who might just require an occasional wrench as opposed to using one every day, for example, your needs will indeed be different, as will your budget. So let’s take a look at some of the key criteria and features you might want to consider before you go ahead and purchase that new cordless impact wrench. Battery - Your cordless impact wrench is only any good to you if it’s fully powered up and ready to support you on the job. There are two types of batteries, one of which is more powerful, expensive and a more recent addition to the world of impact wrenches and that’s the Lithium-Ion style. These hold a steady and reliable charge and overall are probably your best option. The alternative being Nickel-Cadmium battery packs which have been around for significantly longer and are now becoming less popular. Torque & Power - The amount of overall torque your wrench is capable of delivering will ultimately determine its power and reliability. The higher the power, the more useful the tool will be at tackling a wide range of more demanding jobs. The maximum Torque is the main number you should be interested in, but it’s also worth considering the RPN (revolutions per minute) and the IPM (impacts per minute) which your chosen brand of impact wrench can deliver. Grip - Grip is essential if you are going to be using your power towel for prolonged periods. You need something that is ergonomically contoured and designed to fit comfortably in your hand while operating. You should look for a textured rubberized grip with proper trigger placement so that you can efficiently manage, hold and run with the one hand. Portability - By opting for something that is cordless you ultimately will have far more flexibility as well as portability to go anywhere and take that impact wrench with you. As long as you keep top of charging your battery pack, you can’t beat a cordless impact wrench for giving you the freedom to freely move around a work site without having to be tethered up to a power outlet which can cause a trip hazard as well as making tighter restricted spaces challenging to navigate. Variable Trigger - Look out for a variable speed trigger if you want the versatility and flexibility to be able to adjust the speed you’re operating at according to the project in hand. 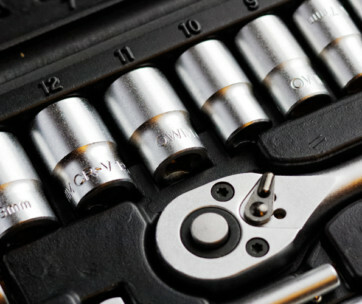 Broadly speaking there are two different categories of impact wrenches; air powered which you might also see referred to as pneumatic wrenches and electric powered which can be either corded or cordless. Of course, they all have their relative strengths and weaknesses, pros and cons and varying price points too. 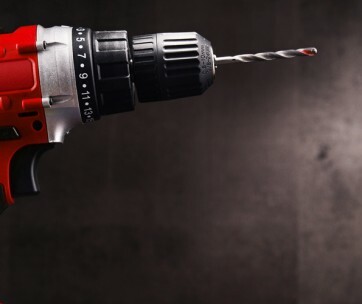 Let’s do a quick caparison below of two of the most popular types which feature heavily on our review today, the cordless impact versus the air impact wrench. Cordless Impact Wrench - A popular choice because of the amount of flexibility they are able to deliver, a cordless impact wrench is powered by batteries, typically either a Lithium-Ion or a Nickel-Cadmium one. They are usually rechargeable and range in power up to 28-Volts with most being around the 18-Volt mark. 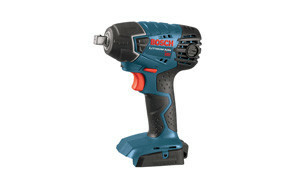 Their most significant advantage is their portability but on the flip side, that power will only be available for as long as the battery remains charged and they may not have the highest torque overall so there will be some limitations in terms of the types of jobs you can perform using a cordless impact wrench. Air Impact Wrench - Their main advantage is that even if you don’t have access to power, you can still use your air impact wrench. They work off compressed air and as the units themselves go, tend or be smaller and therefore more suitable for working in tighter areas where space might otherwise be an issue. That said, they can be difficult to adjust as ordinarily won’t be fitted with a power adjustment mechanism. The downside of not being able to carefully change that torque level is that you may end up breaking or damaging a lug nut or bolt you’re working on by applying more force than is required. A: In a nutshell, cordless impact wrenches are a convenient power tool for anyone who owns a bike, car, boat (or anything else that might have wheels that require changing) to own! If you are likely to need to put in and take out lug nuts, bolts, screws and other small parts, then you are going to need a cordless impact wrench amongst your arsenal of workshop gear. If you work on an assembly line, for example in the automotive industry, then an electric impact wrench is nothing short of a necessity. For a multitude of common DIY jobs though, they’re equally as useful to own. Q: Can a cordless impact driver remove lug nuts? A: The short answer as to whether your cordless impact drives will be able to remove lug nuts successfully is, yes! However, the degree of ease and the time it will take is directly related to how powerful your actual tool is and the amount of torque it produces. To remove a lug nut, you are going to require a minimum of 100 ft-lbs of torque, which is the equivalent of 1200 in-lbs, just in case you prefer to use that metric! Something else to have in mind though is if your nut has been in place for quite some time and has been subject to freezing weather conditions, it may have become lodged more firmly in place and could also have been over-tightened or be suffering from a broken thread. If that is the case, then you’ll require even more torque than the minimum recommendation to prise that lug loose. There are impact wrenches available that can deliver up to 200 ft-lbs of torque so it might be worth investing in the best and most powerful impact wrench that your budget can stretch to. Q: Will impact wrench break bolts? A: The number one issue you’re likely to come across is over tightened wheel nuts and given that an impact wrench is designed to loosen and not just tighten bolts, it’s the perfect tool for the job and definitely shouldn’t break those bolts. Be careful if you are tightening something, and you don’t have a built-in torque limiter, not to go beyond the manufactures specified guidelines otherwise you might run the risk of stretching the threads which can be dangerous. By always ensuring that you have the correct size impact wrench for the project you’re working on, you shouldn’t run into any issues.